Every year, the fashion industry turns to Pantone to announce the color of the year. It seems that Apple was paying attention when they came up with one of the two colors sharing the honor this year: rose quartz. Pantone also announces the season’s most chic colors. This fall they include two shades of pink (of course! ), taupe, “spicy” mustard, “sharkskin” grey… and “lush meadow” green, a jewel tone illustrated in the photo above. At the same time, you and I know – without any input from fashion authorities – that army green is and has been an “It” color for some time. Like combat boots and military-style jackets, army green seems to have become a longer-term trend. And it makes sense. It’s so urban, no-nonsense, and gender fluid – all tendencies in larger cities like San Francisco, where I photographed this beautiful woman (below) in a camo scarf. Let’s face it – army green is the color of a lot of very comfy and utilitarian/durable clothing – including military pieces you might find in a vintage store or a modernized version like this one. Fellow blogger, Jalisa of Style Contour styles hers with pink satin pants for fabulous contrast. That doesn’t mean to say, however, that you shouldn’t enjoy army green in silk. Notice how well it goes with blue denim (below)! A bomber jacket in army green is pretty much the bomb, if you’ll pardon the expression. You might recall Liliya’s fabulous olive green bomber with patches. And if you worry that army green is too olive (or warm) for your complexion, there is always a cooler (more blue than yellow) shade out there like the ones pictured above and below. It’s also a great hue for jeans when you want a break from your light-to-dark wash routine. 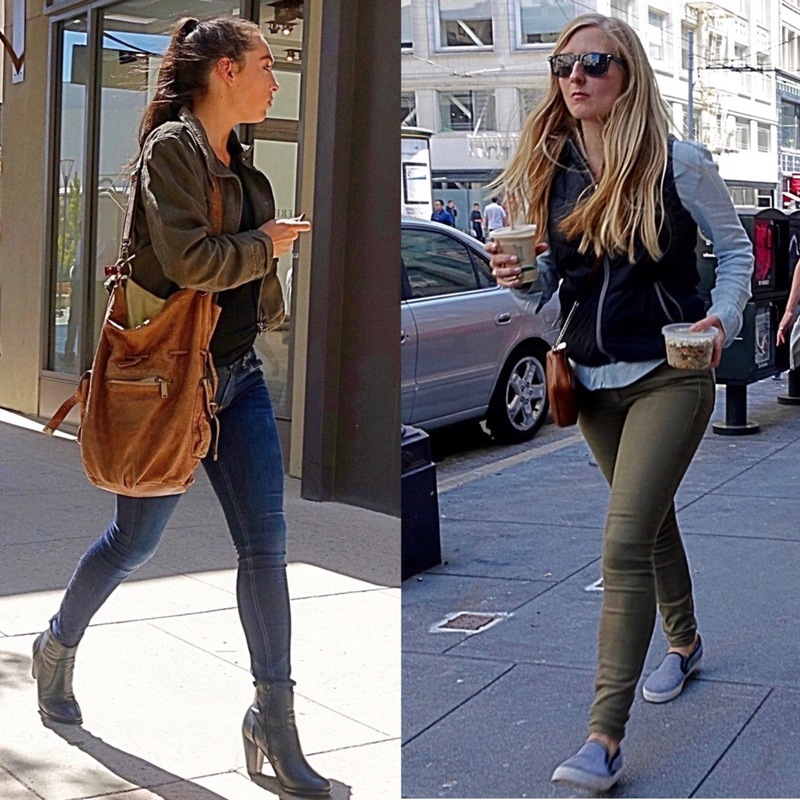 It portrays such an effortless, casual look, which is definitely what’s cool in San Francisco. Nobody wants to look like she’s trying too hard – easy-going is the west coast vibe. 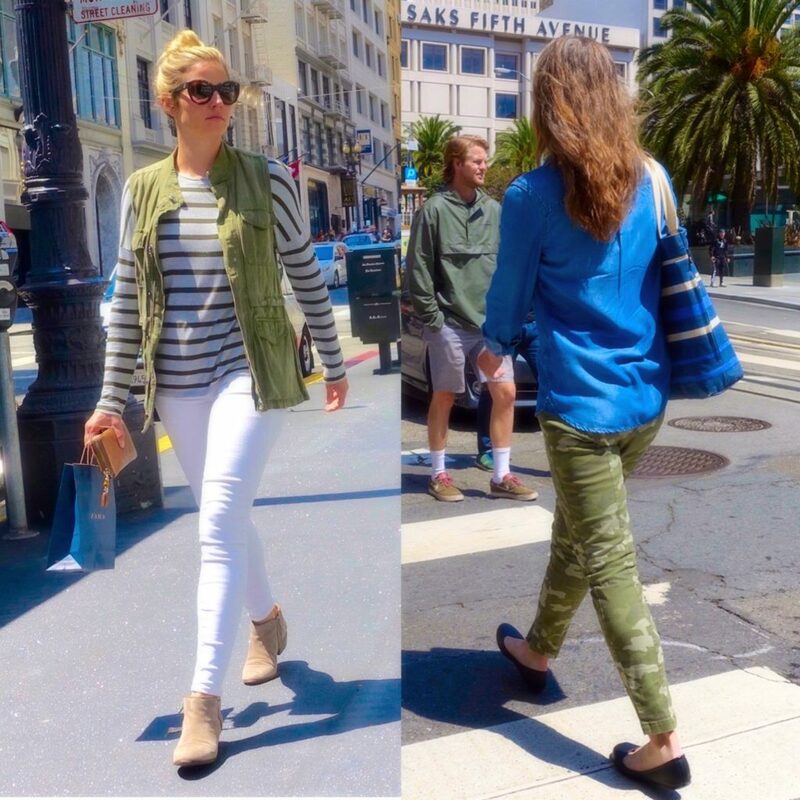 Unlike fashion which can be so frivolous, changing from one season to the next, army green could be considered a pretty “safe” color if you’re thinking about what color to get your next top, jacket, or jeans in for a chic street look. Of course, it also goes wonderfully well with rose quartz or that lush meadow green if you don’t want to completely ignore the Pantone scheme. What do you think of army green, and if you’re also a fan, how do you like to style it? Loving all the army green in the trends lately! Yes! I love army green. It is always in season in my eyes-especially fall. Great post! Army green always looks beautiful. I couldn’t agree more.